Native plant advocates believe in the inherent superiority of native plants. This belief is based on an assumption that native plants “belong” in a particular place and that their presence in the proper location represents an “optimal” landscape for that place. This belief is based on a lack of understanding of the concept of natural selection. Gould credits the native plant movement for efforts to preserve biodiversity, a goal that is defeated if other plants are simultaneously eradicated by their efforts. He counsels native plant advocates to balance their efforts to achieve an inclusive biodiversity and we share that view. We encourage native plant advocates to preserve the plants they prefer and plant more if they wish, but to quit destroying the plants they do not prefer. But Gould does not come to this topic solely from his knowledge of the principles of evolution and his desire for the public to correctly understand its mechanisms. He is also concerned about the “slippery slope” of nativist ideology from application to plants to application to humans. This is not a theoretical anxiety on his part. It is based on historical precedents. Having debated many times with native plant advocates about their plans to eradicate non-natives, and listened to their justifications for those plans, we know that no counter argument inflames them more than the suggestion that their plans are reminiscent of similar efforts to eradicate human non-natives. However, for the vast majority of the public who have not engaged in this debate, we provide the scientific evidence that the native plant movement is an ideology not based on scientific principles which has been associated in the past with horrific discrimination against non-native humans. 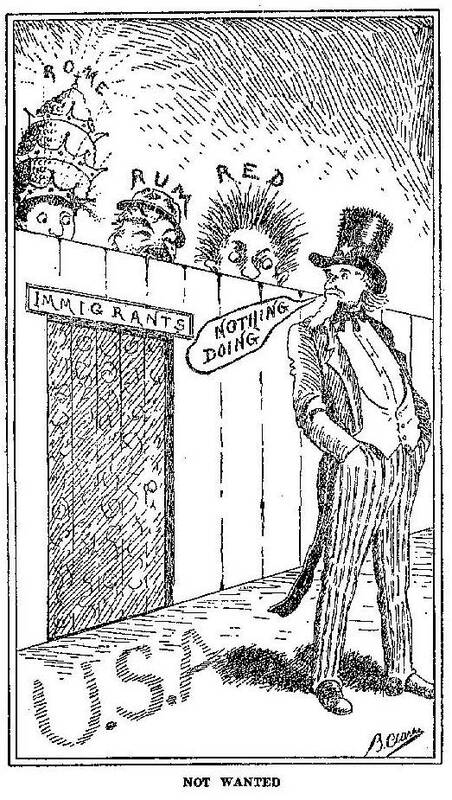 We cannot dismiss these historical precedents as irrelevant at a time when anti-immigration sentiments are rampant in our society. Intriguing article. Stephen Jay Gould’s article, like everything he wrote, is an interesting read. Thanks for this examination of what it says and why it matters. The native plant element in Nazi ideology is historical fact. Here is a paper on that subject: http://www.doaks.org/resources/publications/doaks-online-publications/nature/natur010.pdf. A similar paper was also published by the Arnold Arboretum at Harvard University. I would add that it’s the rapid rate of non-native introductions from all over the world in the last few centuries that has not allowed for formerly natural and gradual co-evolution of local ecosystems, including wildlife. Just notice the increase in wildlife in a native garden after it has been converted from a typical landscape. The flaw in Gould’s argument is that he doesn’t acknowledge the effects of scale and velocity of change on the ability of ecosystems to adapt. (Of course the Nazi analogy is ridiculous). Here is a the opposite opinion, supported by some evidence: http://www.nytimes.com/…/in-your-garden-choose-plants. There is no question that the environment is changing at an accelerating pace because of the activities of humans. However, that just accelerates natural selection, adaptation, and evolution. It doesn’t nullify Mr. Gould’s analysis. It makes it more important. Plants and animals must be allowed to respond to the changes in the environment. Many will have to move to find what they need and to survive. Humans aren’t doing them any favors by trying to freeze them into historical ranges to which they are no longer adapted. Humans should get out of their way. We aren’t smarter than they are. We know very little about what they need. Who knows better than they do? I notice that what little of Gould you quoted is irrelevant to our discussion. Can you send me his original paper (to mjvande@pacbell.net) or post a link to it? A link to Gould’s complete article is provided. Click on the link.